Researchers have created a crystal grown from two relatively common mineral elements – boron and arsenic – that demonstrates far higher thermal conductivity than any other semiconductors and metals currently in use. Now a group of researchers from around the United States has reported that a crystal grown from two relatively common mineral elements – boron and arsenic – demonstrates far higher thermal conductivity than any other semiconductors and metals currently in use, including silicon, silicon carbide, copper and silver. 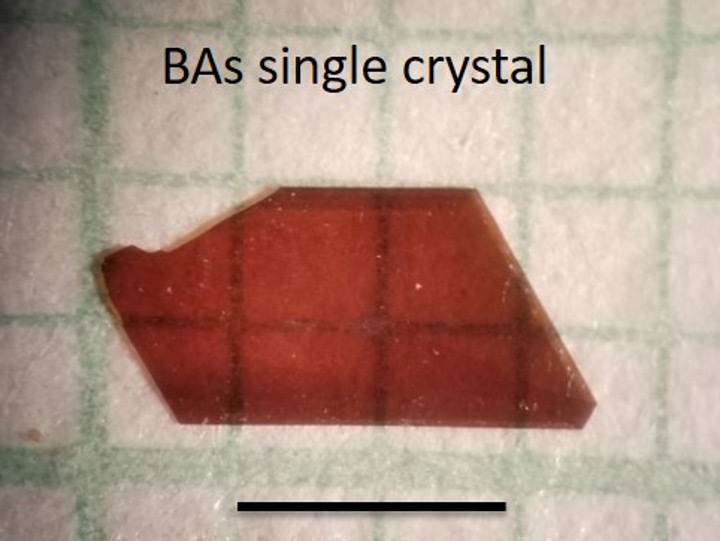 Previous reported efforts to synthesize boron-arsenide have yielded crystals measuring less than 500 micrometers – too small for useful application. But the researchers now have reported growing crystals larger than 4 millimeters by 2 millimeters by 1 millimeter. A larger crystal could be produced by extending the growing time beyond the 14 days used for the experiment, they said. Working with Tom Reinecke at the Naval Research Lab and Lucas Lindsay at Oak Ridge National Laboratory, David Broido, a theoretical physicist at Boston College and one of the authors of the paper, first proposed that the combination could yield a high thermal conductivity crystal, defying the conventional theory that ultrahigh lattice thermal conductivity could only occur in crystals composed of strongly bonded light elements, limited by anharmonic three-phonon processes. This work confirms the theory, although it took a while. Several researchers involved in the current publication, along with Bing Lv, then a researcher at UH and now a faculty member at the University of Texas-Dallas, reported synthesizing a small crystal with a conductivity of about 200 in 2015. Subsequent work in Ren’s lab resulted in the larger, more highly conductive crystal reported in Science. Paul Ching-Wu Chu, T.L.L. Temple Chair of Science at UH and founding director of the Texas Center for Superconductivity, said combining boron with arsenic was a complex challenge. “The mismatch between the physical properties of boron and arsenic makes the synthesis of boron arsenide extremely difficult and boron-arsenide single crystals almost impossible,” he said. The researchers created the crystal using chemical vapor transport, complicated by the fact that boron has a melting point of 2,076 degrees Centigrade, while arsenic changes directly from a solid to a gas. Co-author Shuo Chen, assistant professor of physics at UH’s College of Natural Sciences and Mathematics, said the crystal could be useful in cooling electronic devices. The potential for a semiconductor with high thermal conductivity is immense, Chen said. The project was funded by the U.S. Navy’s Multidisciplinary University Research Initiative, led by Li Shi, professor of mechanical engineering at the University of Texas at Austin. Shi noted that team members at UT-Austin and MIT devised four different methods to validate boron arsenide as the first known semiconductor with a thermal conductivity as high as 1000 Wm-1 K-1 at room temperature. Additional researchers involved with the project include Fei Tian, Jingying Sun, Geethal Amila Gamage Udalamatta Gamage, Haoran Sun, Shuyuan Huyan, Hamidreza Ziyaee and Liangzi Deng, all of UH; Ke Chen, Te-Huan Liu and Zhiwei Ding, all of the Massachusetts Institute of Technology; Xi Chen, Sean Sullivan, Jaehyun Kim, Jianshi Zhou and Yuanyuan Zhou, all of UT-Austin; Navaneetha K. Ravichandran of Boston College; Miguel Goni and Aaron J. Schmidt of Boston University; and Yinchuan Lv and Pinshane Y. Huang of the University of Illinois Urbana-Champaign.